GRACE was a joint project between the National Aeronautics and Space Administration ( NASA ) and the Deutsches Zentrum für Luft- und Raumfahrt ( DLR ). The mission has been proposed in 1996 jointly by the University of Texas at Austin, Center for Space Research ( UTCSR ), the German Research Centre for Geosciences ( GFZ ) and the Jet Propulsion Laboratories (JPL) in Pasadena. GRACE was selected in 1997 as second mission in NASA's Earth System Science Pathfinder ( ESSP ) program. As an innovation, the Principal Investigator Prof. Byron Tapley (UTCSR) and his team are ultimately responsible for developing the flight mission hardware from selection to a launch-ready condition, for accomplishing the scientific objectives and delivering the proposed measurements to the broader Earth science community and general public as expediently as possible. Co -Principal Investigator of the mission was Dr. Frank Flechtner (GFZ). Project management and systems engineering activities are carried out by JPL. The primary science objective of the GRACE mission was to measure the Earth’s gravity field and it’s time variability with unprecedented accuracy. The increase in accuracy has been achieved by utilizing two satellites following each other on the same orbital track. To consider precise attitude and non-gravitational forces both satellites were equipped with star cameras and accelerometers. The position and velocity of the satellites were measured using onboard GPS antennae and (for validation purposes) SLR retro-reflectors. Additionally, the twin satellites were interconnected by a K-band microwave link to measure the exact separation distance and its rate of change to an accuracy of better than 0.1 µm/s. These measurements are directly coupled to the seasonal and sub-seasonal variations in the continental hydrological cycle, to ice mass loss in the large glacier systems in Greenland or Antarctica, to sea level rise, to long wavelength ocean circulation processes or to the transport of ocean heat to Earth’s poles. Thus, during more than 15 years of mission operations GRACE has essentially contributed to a better understanding of system Earth. This becomes visible, e.g. 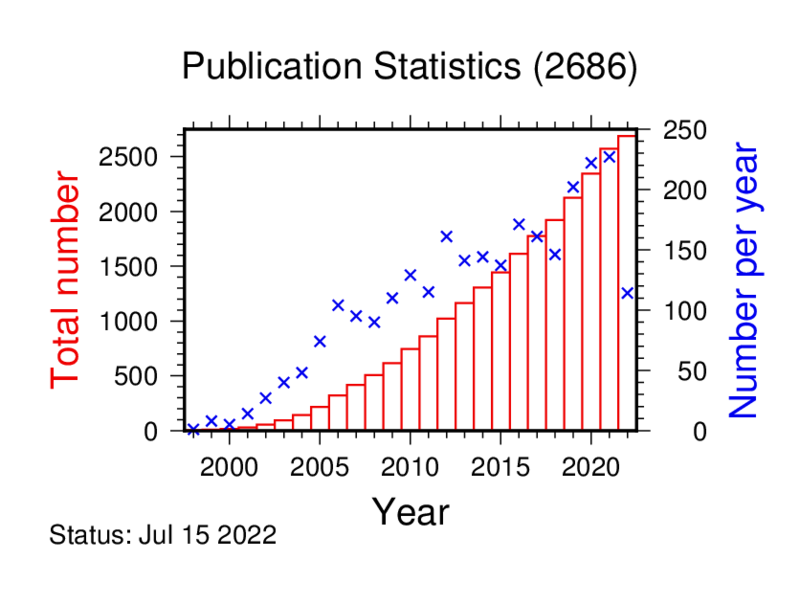 in more than 1700 publications in international peer-reviewed journals or more than 5500 registered users at the GRACE archive ISDC (Information System and Data Center). GRACE has lasted three times as long as originally planned for more than 15 years, but came to an end in October 2017 due to battery problems and running out of fuel. The secondary science objective of the GRACE mission was to obtain about 150 very precise globally distributed vertical temperature and humidity profiles of the atmosphere per day using the GPS radio occultation technique. These profiles have been operationally (24/7) provided to various numerical weather services. The GRACE project was promoted by the Space Agency of the German Research Center for Aeronautics and Space (DLR) with funding of the German Federal Ministry of Economics and Technology (BMWi) based on a resolution of the German Bundestag with support code 50 EE 1027. GRACE ground segment operations were co-funded by ESA. Therefore, ESA is supporting the continuation of the measurements of mass redistribution in the Earth system. The links below lead to a compilation of GRACE and GRACE-FO related publications (no abstracts). This list is periodically updated, but may be incomplete. If you are missing a reference please contact Prof. Dr. Frank Flechtner or Dr. Volker Klemann. Some GRACE-FO-relevant publications can be found also here. the University of Colorado which provides an interactive tool to display fully corrected, de-striped, monthly grids and hydrologic basin averages from GRACE. The GRACE Project is divided into five systems. Each of the five systems is shortly described in the following paragraphs. The SDS functions include science data processing, distribution, archiving and product verification. The SDS is a distributed entity and managed in a cooperative approach by JPL and UTCSR in the US and GFZ in Germany. The cooperative approach includes sharing of processing tasks, harmonization of product archives and validation/comparison of products. Data and products to be processed and archived by the SDS include corrected inter-satellite range and accelerometer measurements, GPS orbit and occultation data, orbit, gravity field and GPS occultation products. The SDS also receives, processes and archives ancillary data (e.g. meteorological fields) necessary for data processing and verification. Further information is given in other pages such as “Products” or “Gravity Field Results”. Based on the predicted orbit for GRACE-A the ground track over Europe is plotted (at 5s spacing) for each month of the GRACE mission to illustrate the ground track coverage. One should note that the actual coverage used for gravity recovery can differ significantly due to larger data gaps in the science instrument data occuring in the particular month. In this way the displayed plots give the "optimum" coverage possible. GRACE/GRACE-FO Science Team Meetings take place on an annual basis alternately at CSR in Austin and at GFZ in Potsdam.